Do Any Essential Oils Help Inflammation? What Can You Do With Lemongrass Oil? What Are the Benefits of Rose Essential Oil? Essential oils are highly-concentrated essences derived from different parts of aromatic plants, including bark, leaves and flowers. The oils are used in a number of ways, from skin-care products to aromatherapy. There are hundreds, if not thousands, of essential oils available and choosing the best one for your needs can be overwhelming. Fortunately, there are a handful of commonly-used oils that cover most of your needs and can be found easily at local heath-food stores or specialty shops. Lavender is one of the most popular essential oils and often has a starring role in everything from skin lotion to pillow mist to “green” household cleansers. Lavender promotes rest and relaxation, especially when inhaled. It also has antiseptic and anti-inflammatory properties according to Aroma Web, making it a good remedy for acne, eczema and other skin problems. There are two types of chamomile oil, Roman and German. Esoteric Oils explains that while both oils have calming properties, Roman chamomile is better at treating mental irritation, impatience and PMS while German chamomile is more effective in the treatment of irritated skin. Both types promote overall digestive health and may help calm an upset stomach. Eucalyptus oil has a very distinct, strong aroma and can be used to treat a variety of ailments, including headaches, flu symptoms and muscle pain. When used in a vaporizer, the oil can help open up sinus passages and relieve coughing, sneezing and other respiratory symptoms. To relieve aches and pains, add a few drops to massage oil or bath water. Medline Plus cautions that eucalyptus can be fatal if ingested even in very small amounts and may cause allergic reactions when used topically. It should also not be used by those with heart conditions, high blood pressure or epilepsy. Peppermint oil, with its candy-like aroma, is a great mind stimulator when inhaled, promoting mental clarity and enhancing focus. It also works wonders on headaches and stomach discomfort. This oil has been used since ancient times in Japan and China, and may have been used by Egyptians as early as 1000 BC, according to Esoteric Oils. Peppermint oil can be irritating to the skin and should be kept away from the eyes. 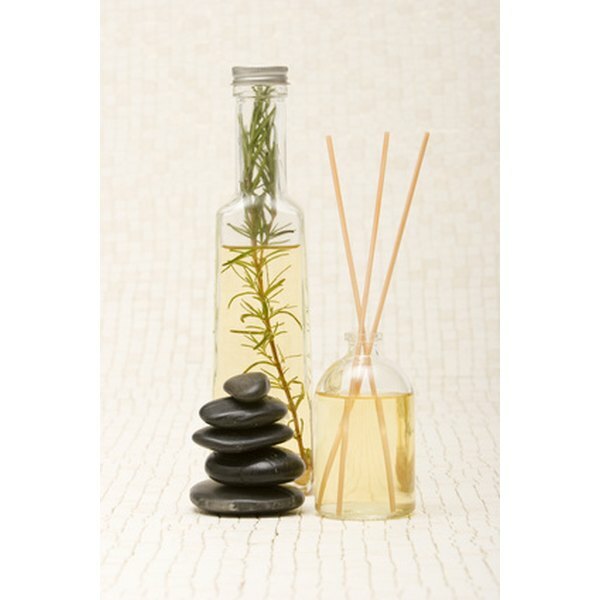 Produced only in Australia, tea tree oil is a very powerful antiseptic and antibacterial essential oil. Tea tree oil can be used to treat fungal infections such as athletes foot and nail infections, relieves itching caused by insect bites and can be diluted into a mouthwash to treat gingivitis or bad breath. It is also one of the few oils that can be applied undiluted, although this should be done with extreme caution as it can cause a reaction in those with sensitive skin. Rose oil is a great multi-purpose oil, but it can be very costly due to the difficult extraction process. It can take up to 60,000 roses to produce one ounce of rose oil, according to Rose-Works. “The Illustrated Encyclopedia of Essential Oils” by Julia Lawless recommends rose oil for treatment of eczema, depression, stress and symptoms of menopause and sexual dysfunction. Never apply a pure essential oil directly to your skin. Essential oils are extremely potent in their undiluted form and need to be added to carrier oil, such as almond, apricot kernel or olive oil. Do not ingest essential oils. If you suffer from a pre-existing medical condition, check with your doctor before using essential oils, as some can interact with medications. Pregnant women and young children should not use essential oils unless under the guidance of a medical professional. Based in East Stroudsburg, Pa., Nicole Etolen is a freelance writer, blogger, and former Certified Nursing Assistant. She has been professionally writing since 1995, with articles appearing in "Lehigh Valley Bridal Magazine," "A Reader's Guide to the Underground Press" and numerous independent publications. Nicole is also the owner and sole author of Pretty Opinionated, a successful lifestyle blog for busy moms of school-age children, as well as a staff writer for several other parenting sites. What Are the Benefits of Patchouli? Can Jojoba Oil Help Acne-Prone Skin? What Are the Benefits of Ginger Oil? What Are the Benefits of Rosewood Oil?